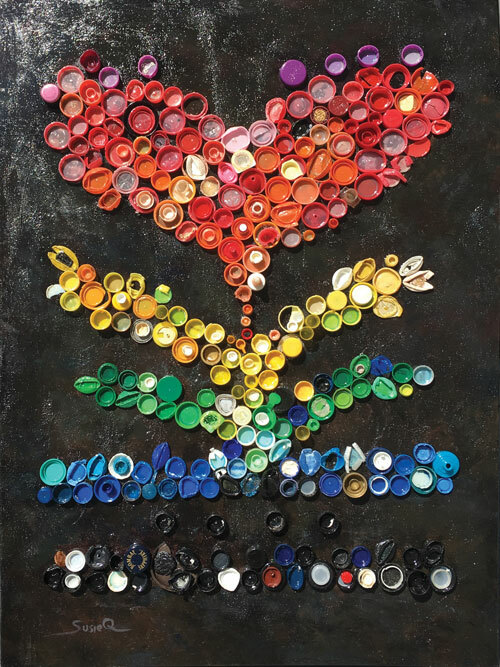 "Global Garden of D' Caps"
This award winning piece consists of plastic bottle caps from the beaches of Fort Lauderdale, Florida. They are organized by color telling of the story of growth, over time. As the lower caps take root, the flower begins to grow, then ultimately bloom to create more of the same species. As plastic bottle caps are found globally, hence the title... Global Garden of D'Caps. Original mixed media is on a thick black stretched canvas and coated with exoxy. It is available and F.O.B. Broward County, Florida. Shipping is extra and the artist will be happy to give you a quote. $2,500, 30" x 40". Ready to hang. Read about the Global TRASHformation movement and see how you can make a difference. Take the pledge today.